Neo Bowser Castle is the final area that appears in Mario & Luigi: Dream Team. 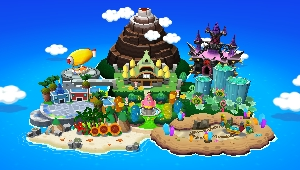 On Pi'illo Island, it doesn't appear until the middle of the game, where it appears floating high above the island, until it is grounded and lands in the east, north of Somnom Woods and east of Mount Pajamaja. It can be reached by traveling north in the area between Mushrise Park and Somnom Woods. 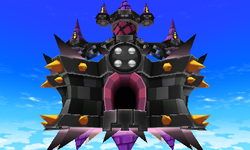 Neo Bowser Castle is a large, black, ominous castle that is a mix of Bowser and Antasma's designs. The outer walls have spikes and a red symbol of Bowser's face appears on the front, and is topped with tall, purple towers and spires with the central tower being the tallest. The interiors of Neo Bowser Castle are like many of Bowser's previous castles, filled with seas of lava and spikes with some colored tiles of his face in red, blue, green and yellow. Not seen before in previous Bowser castles or final dungeons in the Mario & Luigi games, shadowy-themed elements from Antasma are also present: many dimly lit rooms; dark torches; strange, giant purple vines, structures and tendrils are seen throughout the castle with shadowy particles occasionally rising from the ground. Neo Bowser Castle is vast and has many rooms and floors, each requiring the Bros. to clear several obstacles on one floor to advance to the next. Because puzzles in the castle are divided with the dream worlds there, the puzzles in the castle itself are relatively few and simple compared to previous final dungeons such as Bowser's Castle from Mario & Luigi: Superstar Saga and Shroob Castle from Mario & Luigi: Partners in Time. Near the main passageway in the castle are two Warp Pipes that can transport the Bros. to the upper floor they have previously cleared, and just outside the castle's entrance is a shop. Neo Bowser Castle is divided into four areas on the map. Area 1: Mario and Luigi enter the castle itself in this area, with a shop just outside the entrance. Switches that lower gates are present, with one gate blocking entry to the first dream world, where Kamek is fought. Area 2: A very expansive second floor, it is divided in two sections. Mega Bob-ombs are used to press the gates' switches. There are two dream world spots where the Bros. must go to defeat Kamek. On the first floor's foyer, two Warp Pipes are present which can transport the Bros.: the one on the left leads to the beginning of the floor; the pipe on the right leads to the end, near the elevator that leads to the third floor. Area 3: Three giant flames from the dream worlds blocking entry to the fourth area are present; the Bros. must make their way to the three dream worlds from the west and east sides to make them disappear. Several outdoor areas are here as well. Area 4: The final area of Neo Bowser Castle. Bowser's Bedroom: This room is where Bowser sleeps to provide power to the castle. The gigantic Dream Vines beneath Bowser's bed serve as a Dreampoint, to the seventh and final dream world. At the end of this room is an elevator that leads the brothers outside. Main Lair: This outside area is where Antasma is fought for the final time. At the end of this room is the entrance of the castle's tallest tower. Spiral Staircase: A long, spiral rainbow-colored passageway Mario and Luigi must work their way up to reach elevator that goes to the balcony. The former Elite Trio is there to throw Bob-Ombs and Mega Bob-ombs at them to slow them down. Balcony: The final floor where the final battle with Dreamy Bowser is fought. At the summit of Mount Pajamaja, with the Dream Stone charged, Antasma wishes for a castle for him and Bowser, one that is impenetrable and also one that is feared. A large castle, a mix between Bowser's and Antasma's designs, comes out of the Dream Stone and floats into the sky. Antasma then tries out the castle and destroys several small islands around Pi'illo Island with large lasers. Then a large impenetrable shield surrounds the castle. Bowser dubs this castle Neo Bowser Castle. Inaccessible for most of the game, Mario and Luigi gather the parts of the Ultibed to reach the Zeekeeper in the dream world, as he is the one who can break the shield surrounding Neo Bowser Castle and send it to the ground so the brothers can defeat Antasma and Bowser. When Mario and Luigi storm the castle, most of the important areas are blocked with sturdy gates that must be lowered by pressing several switches that power the gate using all the navigational techniques they've learned throughout the game. Kamek will also hinder progress several times by casting spells on the doorways, warping the brothers in different sections than they intended, before going through dream portals created by Antasma. Scattered throughout a floor of the castle are Kamek Blocks that are used to reveal exactly where a spell warps the Bros. to and from on the map. By lowering the gates blocking floating Koopa Clown Cars that Luigi can then use to sleep on, the Bros. can get to Kamek through the puzzle-laden dream worlds, where they can defeat him to lift the spells placed on the doors so they can move forward. As they travel up the castle, Mega Bob-Ombs will also come into play and the brothers must use air vents to navigate them into pressing the gates' switches if their abilities alone are not enough. Deeper in the castle, after defeating Kamek a third time so that he no longer casts spells on the doorways, the brothers are stopped by several intense dark flames being shot out of portals from three Dream Worlds, which they must make their way to and destroy the pipes spewing them. Upon succeeding in doing so, Mario and Luigi enter the doorway at the end to find Bowser sleeping on Antasma as a pillow with a barrier protecting him. Prince Dreambert states that the strange purple vines they've seen everywhere throughout the castle are what powers the building, and that they originate from Antasma. Luigi suggests they enter Bowser's Dream World, Prince Dreambert realizing they could try what they did with Big Massif with Bowser. Prince Dreambert connects himself to the vines as pillow form, and Luigi sleeps on him, Mario entering the Dream World where he and Dreamy Luigi confront and take down a powered-up Bowser. By defeating Bowser in his Dream World, the vines that supplied the power to the castle turn gray. Mario and Luigi leave the Dream World and after pursuing the evil duo, discover that Bowser was planning to double-cross Antasma all along. Antasma reveals he had made a wish on the Dream Stone for the ability to create Dream Portals at some point, and flees from Bowser through one. Bowser, meanwhile, flees himself with a Paratroopa holding Princess Peach. Prince Dreambert decides to fight Antasma just as he did centuries ago, and loses. Mario decides to avenge him and jumps into the Dream Portal himself. Dreamy Luigi and a barely conscious Prince Dreambert join in the fight to assist him. After Mario defeats Antasma for good, they leave the Dream World, knowing they still have Bowser to take care of. The Bros. then work their way up a long spiral passageway, and narrowly avoiding Private Goomp, Sergeant Guy, and Corporal Paraplonk's Mega Bob-Omb attacks, Mario, Luigi, Starlow, and Prince Dreambert make it to the castle balcony, where Bowser and Peach await. Bowser boasts about the power he now has, with the Dream Stone and Peach in hand. Suddenly, Peach and Starlow activate their wish power from the previous game and, at the request of Prince Dreambert, destroy the Dream Stone. Bowser is initially shocked about this, but then screams in rage, "NOT YET!" as he inhales the Dream Stone's pieces and becomes a form known only as Dreamy Bowser. Mario and Luigi engage battle with him, and upon winning, knock him flying into the sky. Suddenly, without the Dream Stone to maintain it, the castle begins to crumble, but the Zeekeeper gives Mario and friends a lift back to Pi'illo Castle just in time. Spanish (NOA) Neocastillo de Bowser Bowser's Neocastle. The castle's music uses the beginning notes of Bowser's leitmotif in the Mario & Luigi series in the beginning, and during the chorus. The violins during the song's chorus is also a nod to Antasma, whose leimotif uses violins. The location of Neo Bowser Castle from hanging in the sky to falling to the ground is the reverse of Bowser's Castle in Paper Mario, which rises from underground to floating in space. In the first room on the second floor northwest of the elevator are all four colors of the castle's tiles placed together. When the pattern is rotated counter-clockwise, it becomes the color pattern of the buttons on the Super Famicom controller. This page was last edited on March 24, 2019, at 02:05.